In my experience, this is a unique book. It is part cookbook, part dietary compendium, part nutritional encyclopaedia. 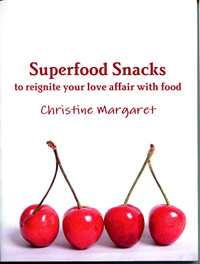 It was created out of a need for Christine Margaret to find a way of ridding herself of fibromyalgia syndrome. January 1788, around the 26th, is symbolic of a major shift in how many contemporary humans related to their world. It is symbolic at many levels. In my last post I ruminated on the role of money in the way we value ourselves and what we do. Is community life possible without money or its equivalent? A related question is, can a family or a small community be truly independent of all others? What are you worth? Do you answer this in terms of your monetary value? Does it make you contemplate the value of what you can do? Do you answer in terms of selling your body? The first question has many answers and all of these depend on assumptions you make, consciously or unconsciously. All over the world people are thinking about what this new year will bring to their lives. Will the world be different? Can they (or will they) make changes in their habits this year? Will life be better? Is this the year that Homo sapiens will snuff it?